I love knitting. I’m pretty sure that’s a commonly accepted fact about me – if you’re around me any length of time, you will either see me knit, see my fingers twitch as I wish I could knit but I can’t because non-knitters think it’s socially inappropriate, or hear me talk about knitting. I also love to read. I read voraciously, all-but-incessantly, many times a day. I have Kindle apps on everything electronic except for my Kindle itself. One of the types of books I like to read is…can you guess? KNITTING books 😉 After recently (re)reading No Idle Hands: The Social History of American Knitting and Knitting America: A Glorious Heritage From Warm Socks to High Art, a particular project struck me from both. 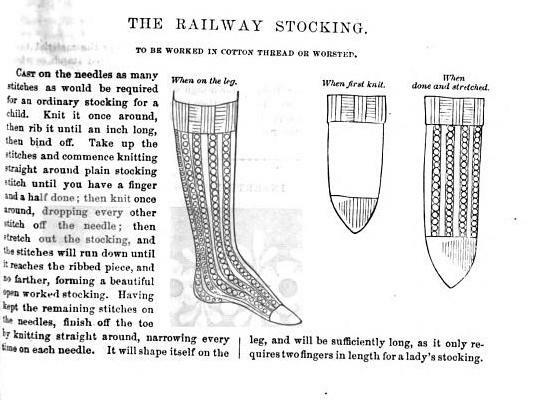 The cool thing about this stocking, though, is that it’s a tube sock that manages to be lacy. And the technique – deliberately dropping stitches and watching it stretch and turn from boring sock to awesome sock – that was too good to pass up. So I picked up some brown yarn (I lost the label, but it’s wool, nylon, and a little elastic) and cast on. I found one other person who had actually knit these, so I scanned her notes, took what I knew of making socks for me, and cast on 60 stitches on a US3 needle. I used Jeny’s Slip-Knot Stretchy Cast-On, knit a 1/1 ribbed cuff for 1.5 inches, and used Jeny’s SSBO. I picked up my stitches, knit for about an inch, and then switched to a US1.5 needle. I knit for a total of 9.25 inches, and then (at knitting circle, of course, since my knitting friends were just as curious as I!) dropped every other stitch and pulled. It was really amazing – yes, I’m aware that I’m easily amused, but it was awesome to see it morph. I’ve detailed it in the images below (and if you’re curious what the green thing is, it’s my wonderful Thera Cane Massager .) You can also see my senile crazy cat, who was obsessed with these – or maybe she was just trying to figure out why I was contorting taking foot pictures at 2am! I will knit for 12 inches, and not 9.25. I have size 11 feet! So the extra length would allow me to tie a garter right below my knee, instead of my upper calf. Other than those things, I love them. And I can see more of these in my future – while knitting inches of stockinette in the round is boring (and while I don’t mind turning a heel, especially toe-up!) it’s super-cool to drop stitches and yank on the sock and watch the ladders form.